The Sun moved out of the optimistic, free flying, happy-go-lucky sign of Sagittarius and has moved into the more cautious, calculated and career minded sign of Capricorn (at approximately 11 a.m. EST on December 21, 2017). Remember the Sun has an orb of influence of about 16 degrees, so if you are born on the cusp even as far in as 2-3 degrees Capricorn, you will be influenced in part by the formative Capricorn traits but also be influenced with the optimistic approach to life associated with Sagittarius’ energies and this is just your sun sign influence. Those with their Sun in Capricorn know what it takes to be successful, whether this is through their life’s duties and career potential or whether this is through their obligations and financial responsibilities to their family. Capricorn individuals are steadfast in their approach to life and will work diligently towards goals they set for themselves. 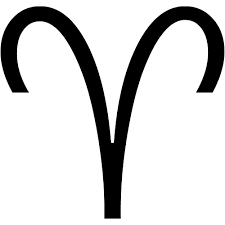 This is a resilient Zodiac sign that is able to withstand the pressures of life and although they are emotional, these emotions are not easily expressed. Capricorn individuals feel things on an intense level from within. 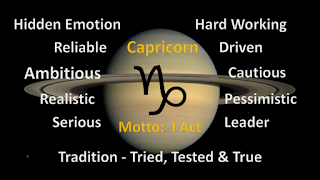 Capricornians’ need for achievement (which is very prevalent in most earth signs) often puts them in a leadership role or at least puts them in a position of authority. They also respect authority and achievement. They understand intuitively what it takes to move up the ladder of success. They respect authority because they respect hard work in others as much as they pursue this themselves. The “tried, tested and true” is what they adhere to. Laziness and poor judgement does not sit well with Capricorns. Transiting Saturn will be moving into the sign of Capricorn towards the end of 2017 and will remain in the first 10 to 11 degrees of Capricorn for most of 2018. Saturn is at home in its natural rulership sign and for those with their Sun in the early to mid-degrees of Capricorn may find this year to be a year of achievement and corporate recognition for the work that they have been doing in the past. Much, of course, will depend on the overall condition of Saturn in your natal chart and the aspects to the natal Sun. Check your chart or ask as Astrology to check which house that Saturn will be transiting through to hone in on the area of life that will be highlighted for you specifically. It takes about 2 ½ years for Saturn to move through a sign and those with Saturn in the sign of Capricorn in their birth charts will be experiencing their Saturn return (ages 29, 58 and 87). The Saturn return is an extremely important period in life when we often experience life changing events, often challenging, but when we move through this time in our lives we come out stronger and changed on a permanent basis - for the better. This is a maturity period especially the first return at 29. Most individuals will feel the energies as much as a year before the actual return to the birth position. Saturn, the ruler of Capricorn, is all about structure and stability that is maintained through constant effort and a building process that encourages strength and solidity often after hard work and a disciplined approach. Get ready for more responsibilities and opportunities to learn. 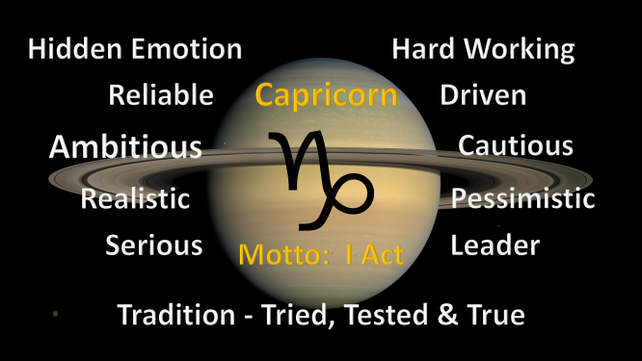 Saturn is the teacher and the disciplinarian but also offers rewards for hard work and diligent efforts.